On June 15, 2010, the National Academy of Sciences (NAS) began a major restoration of its building at 2101 Constitution Ave., N.W. The project will restore and improve the building’s historic spaces, increase accessibility, and bring the building's aging infrastructure and facilities into the 21st century. "Since 1924, the NAS building has been an important symbol of the role of science in our nation," said NAS President Ralph J. Cicerone. "Our restoration will honor that rich history and enhance the usability of America's home for science." NAS is committed to making this historic structure on the National Mall more energy efficient and environmentally advanced. To meet that goal, the restoration includes sustainable designs and green technologies, including the use of some solar power and green construction materials. These efforts will reduce the building's energy use by an estimated 40 percent. Workers will also recycle materials removed from the building during construction. The NAS building serves many purposes. It is headquarters for the NAS, the National Academy of Engineering (NAE), the Institute of Medicine (IOM), and the National Research Council (NRC). The building is a conference center for the institution's study committees as well as other groups. It is also a workplace for the leadership and staff of the institution, as well as a venue for public lectures, exhibitions, and concerts. For the next two years, many of the employees working at the NAS building will move to the Keck Center at 500 Fifth St., N.W. Some events will be held at nearby venues in downtown D.C. Cultural Programs of the NAS will continue to host exhibitions and events at the Keck Center during the restoration. Located between the Lincoln Memorial and the U.S. Department of State and adjacent to the Federal Reserve Board, the NAS building is one of the few privately owned buildings on the National Mall. 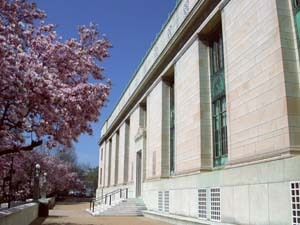 The building was designed by architect Bertram Grosvenor Goodhue, and on April 28, 1924, President Calvin Coolidge dedicated the building as "the Temple of Science in America," saying, "It is not a place of mystery, but one to lead the public in thinking deeply and seeing how research can explain fundamental problems." The Einstein Memorial Statue, a favorite site for locals and tourists, will remain open during the restoration. The projected completion date is April 2012, and the work will cost an estimated $50 million. The National Academy of Sciences, National Academy of Engineering, Institute of Medicine, and National Research Council are independent, nonprofit institutions that provide science, technology, and health policy advice under an 1863 congressional charter.